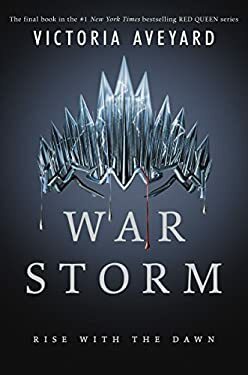 The #1 New York Times bestselling Red Queen series comes to a stunning conclusion in War Storm. VICTORY COMES AT A PRICE. Mare Barrow learned this all too well when Cal's betrayal nearly destroyed her. Now determined to protect her heart--and secure freedom for Reds and newbloods like her--Mare resolves to overthrow the kingdom of Norta once and for all . . . starting with the crown on Maven's head. But no battle is won alone, and before the Reds may rise as one, Mare must side with the boy who broke her heart in order to defeat the boy who almost broke her. Cal's powerful Silver allies, alongside Mare and the Scarlet Guard, prove a formidable force. But Maven is driven by an obsession so deep, he will stop at nothing to have Mare as his own again, even if it means demolish everything--and everyone--in his path. War is coming, and all Mare has fought for hangs in the balance. Will victory be enough to topple the Silver kingdoms? Or will the little lightning girl be forever silenced? In the epic conclusion to Victoria Aveyard's stunning series, Mare must embrace her fate and summon all her power . . . for all will be tested, but not all will survive. New (581 available) BRAND NEW. Over 1.5 million happy customers. 100% money-back guarantee. Make your purchase count: support Better World Books' worldwide literacy partners.